2019 GMC Acadia vs. 2019 Buick Enclave: Compare reviews, safety ratings, fuel economy, etc. The GMC Acadia offers rear passengers about the same room to stretch out as the Buick Enclave, with comparable head- and legroom. 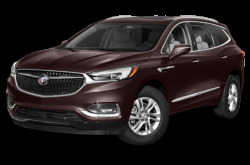 The Buick Enclave offers just a little more front head- and legroom than the GMC Acadia, offering the driver and front passenger a bit more room and comfort. You'll be making about the same number of stops at the gas station with the GMC Acadia as you will with the Buick Enclave, as they are both able to travel similar distances on a tank of gas. There are a lot of factors to consider when calculating the overall cost of a vehicle. The main consideration is Manufacturer's Suggested Retail Price (MSRP). Clearly, the GMC Acadia is a better financial choice over the Buick Enclave, when considering MSRP. Another consideration is the Destination Charge, which is a standard charge for transporting the vehicle to the dealer from where it's built. Both the GMC Acadia and the Buick Enclave have similar Destination Charges. Since the GMC Acadia is much slimmer than the Buick Enclave, it'll be much easier to find a wide enough space in a crowded parking lot. If you go with the GMC Acadia, you'll have a much easier time finding a large enough space to park than you will with the Buick Enclave. The GMC Acadia has much lower torque than the Buick Enclave, which generally means that it won't feel as fast or powerful. The GMC Acadia has the same turning radius as the Buick Enclave, so they both maneuver the same in and out of tight spots. In terms of towing capacity, the Buick Enclave is clearly the choice over the GMC Acadia for pulling heavy loads. In terms of horsepower, it's a virtual tie between the GMC Acadia and the Buick Enclave. In terms of seating, you'll be able to fit about the same number of people in both the GMC Acadia and the Buick Enclave. The GMC Acadia has significantly less cargo capacity than the Buick Enclave. The basic warranty of the GMC Acadia is not as nearly as extensive as that of the Buick Enclave. 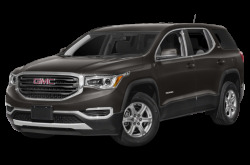 Compare the 2019 GMC Acadia and the 2019 Buick Enclave.